Mounting to wall: Cross beam resting on two nails, one either side. Whole cross mounted on to an upright wooden plank to keep it in one piece, this is held up at base of cross by nail. At base of cross is curved metal piece, on top of several other pieces of wood attached to front, these don’t seem to be for support. Evidence of use in field (earth marking, cracking, staining, shrinkage): Massive upright crack along 2/3 of cross and chunk of cross missing half way up. Stained dark brown up to half way of bottom part of upright plank. Finish (varnish, paint, oiled, unfinished etc. ): Unfinished, no varnish. Missing chunk of wood in middle, so has been mounted on horizontal plank to secure. Large crack on upright beam. 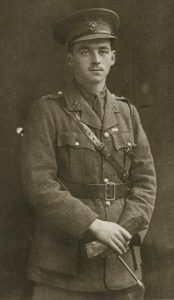 Valentine Ashworth Braithwaite, MC (b.1896 d.1916) was educated at Winchester College and joined the 1st Somersets in September 1914. The P A on the cross also refers to the 1st Somersets who were also known as Prince Albert’s .He was one of the first recipients of the newly instituted Military Cross in 1915, awarded for defending a barricade during a German attack near St Yves, Ploegsteert wood on 30th October 1914. He was killed aged 20 at Serre on the first day of the Battle of the Somme, 1st July 1916. 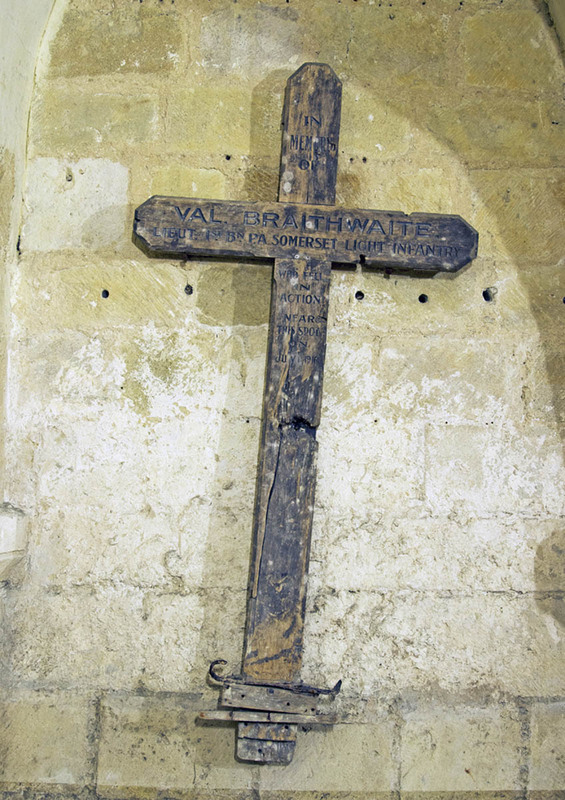 His body was never recovered, but the wooden grave marker in Winchester Cathedral was probably placed near to where his father thought he had been killed in action. It was returned to Winchester where his uncle was a Canon and is mounted on the wall in the Norman Crypt under the cathedral. 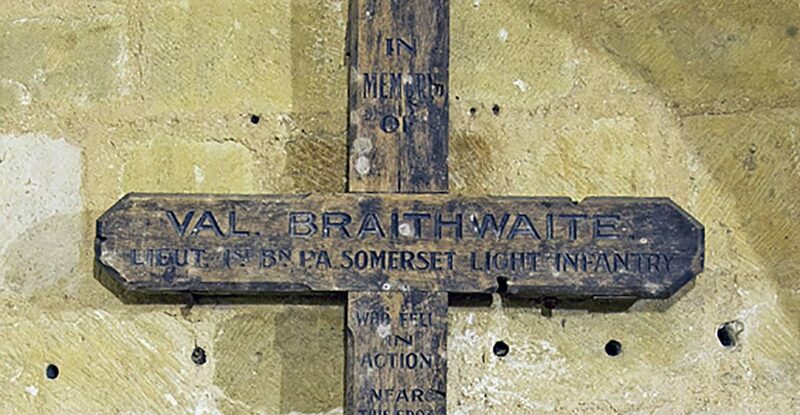 Val Braithwaite is also commemorated on the Thiepval Memorial, In Winchester College’s War Cloister and on a stone cross at the Serre Road No 2 Cemetery.